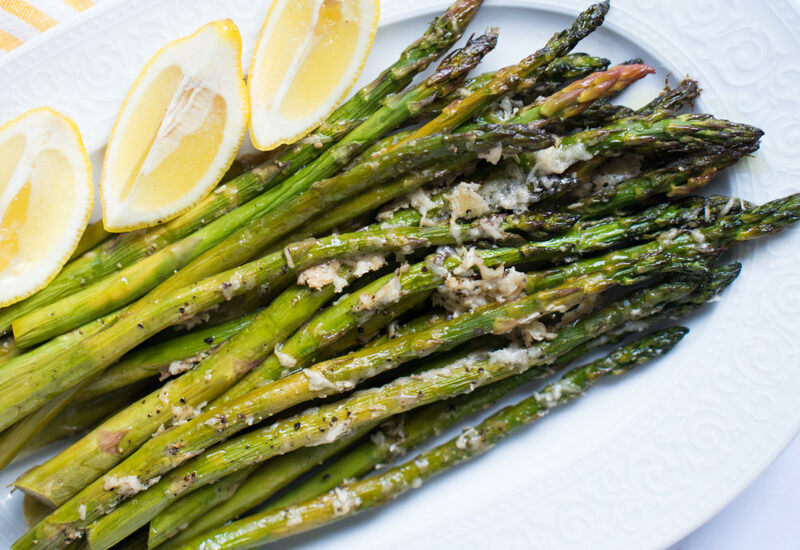 This Parmesan roasted asparagus recipe makes one fantastic side dish for entertaining! Both ridiculously tasty and deceptively simple, this four-ingredient dish will have you coming back for seconds. Roasting the asparagus in olive oil and garlic results in crisp-tender stalks with just the right amount of smoky char. A dusting of salty grated Parmesan cheese finishes the dish. Serve with lemon wedges if you want a little acidity. It's the perfect springtime vegetable side served with roasted salmon at dinnertime, or poached eggs and toast for brunch. Look for asparagus stalks that aren't too thick, and be sure to snap or cut off the woody ends before roasting. Make a double batch and use the leftovers in a grain salad, or on top of a pizza or flatbread. They're a deliciously crunchy addition to many dishes! Per Serving: 89 calories; 9g fat; 1.6g carbohydrates; 2g protein; 5mg cholesterol; 188mg sodium. Nice and simple asparagus side I served with my sous vide beef filet. It accompanied the asparagus nicely. I love asparagus, so I am probably biased when it comes to this recipe. However, I will say that roasting with Parm really takes it up a couple notches. If you haven't tried this recipe, you need to! Made this roasted asparagus with a fried egg and hollandaise sauce. One of my favorite spring dishes.